By the 1990s there were a few genre films that had become labeled ‘dead’. They were genre pictures that generally audiences just didn’t respond to anymore no matter what kind of tricks or how much money were put into them. Musicals, westerns, gladiator movies. It would take a number of years before these would become revitalized and come close to reaching the levels of popularity they once enjoyed and attract audiences again. But during this stretch of time they were all viewed as risky projects and just not a good idea to invest in them, which explained their rarity when they did actually crop up. One such genre that was considered box office poison was ‘the pirate film’. It had been a long time since the swashbuckling heights of Captain Blood, The Sea Hawk and The Buccaneer when audiences were dazzled by sword and sails adventures. 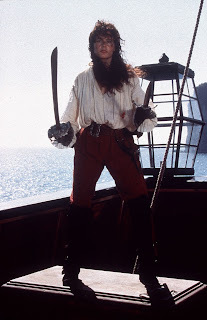 During the course of the 1980’s, the pirate genre got a few entries – The Pirate Movie, Yellowbeard, The Pirates of Penzance and Roman Polanki’s Pirates. None of which created excitement or renewed enthusiasm. Some were downright embarrassing! That didn’t stop director Renny Harlin and Carolco Pictures from making the big-budgeted Cutthroat Island. With Harlin’s then-wife Geena Davis as the star, an astronomical budget of $98 million and countless production problems, the film would eventually become one of the biggest, most notorious box office flops of all time. It would be one of the final gasps of Davis as an A-list star and be a contributing factor to the demise of Carolco. Davis plays Morgan Adams, a tough as nails swashbuckler who is in search of three pieces of a map that will lead to a treasure of gold on the mysterious Cutthroat Island. Her two uncles and father possess these separate pieces, however her fourth uncle the evil Dawg Brown (Frank Langella) is willing to spill any blood to get them, even killing his brothers for them. Fortunately before he dies Morgan’s father gives her his piece of the map, which just leaves two for her to track down. Now captain of her father’s ship, Morgan recruits a thief Willam Shaw (Matthew Modine) to translate the Latin written on the map. From there they form an uneasy partnership as they search for the other pieces of map, get into a lot of pirate-y action, culminating in a huge showdown against Dawg for the riches of the treasure. 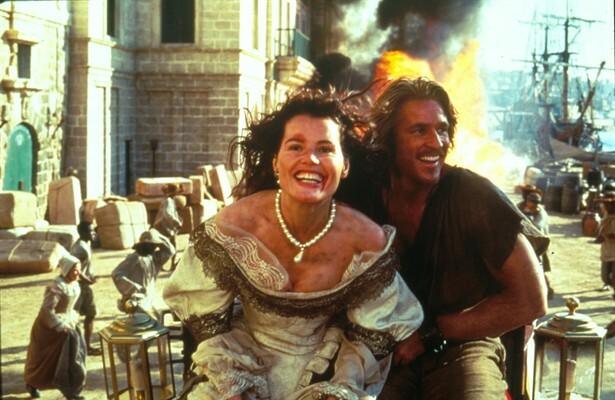 Cutthroat Island has all the staples one would expect from a pirate movie. We get the sword fights, cannons firing, big ships attacking each other, a buried treasure, filthy looking extras, swinging from ropes, a sweeping orchestral score, a monkey providing comedy relief. The only thing Cutthroat Island doesn’t have is someone walking the plank. I can’t remember the last time I saw anyone do that in a movie. Despite its infamous reputation I was able to enjoy Cutthroat Island more than I expected to. Wiping away all the notoriety attached to it, the film does contain some good stuff – notably the action sequences. Much of it is done with practical effects and there are some scenes that are thrilling to watch. It’s helped along with a great score by John Debney. This isn’t to say the movie doesn’t have it’s problems. The story is a standard pirate-y one – finding a buried treasure and fighting the sinister bad guys who are also after it. There’s nothing special about that. This simple premise fails to really get involving and it didn’t keep me engaged with finding the treasure and piecing together the clues that will lead them to it. I was never on the edge of my seat awaiting to see where the characters will be taken next and what they have to do. In the heroic gender role reversal I thought Davis was fine with her derring-do antics. She’s handles her sword, the running, the jumping all fairly well. Sometimes an actress cast in an action role is just not up to the challenge and needs a lot of help from the editors and stunt people. Here Davis is pretty convincing. Later in her career she would become a world class archer, so it’s clear she possess some athletic ability and it shows in her performance here. This sadly is the only part of her performance that comes off well, as the rest of the time she’s saddled with cheesy dialogue and wooden speeches that derail any believability of her strong character. Her statuesque frame standing over her crew looks good, but when she starts barking orders I just don’t buy it. It’s very disappointing. I have much more fun watching her in her action scenes than I do when she has to exchange dialogue with other characters and even worse trading romantic barbs with Modine. There are no real sparks between Modine and Davis. It’s just one of those things where that onscreen chemistry is lacking between two actors. I can’t explain it, but it just comes across as very forced. They both look like they’re trying, but what they’re given to work with just falls flat. Langella is fun hamming it up as the villain, which isn’t a surprise for anyone who has seen him play a villain before. His character is the most fun to watch overall out of the cast. The film does deliver on some of the spectacle that so much money was spent on. There’s some terrific scenery on the screen. Harlin stages some fun scenes with a horse and carriage, two ships battling side by side and our heroes hanging alongside a cliff. You can see the effort that was put into it all and the practical effects have held up well. During one explosive scene it’s interesting to see Modine get hit in the head with a flying barrel which obviously was not planned. For some reason some segments of the action are played in slow motion. That wouldn’t be so bad, but the characters continue speaking in regular time. It just makes things look very awkward. There are some bits where early CGI effects are used and are very noticeable, but overall though the action is pretty good, over-the-top kind of stuff. It’s not a terrific movie, but I certainly don’t think it’s the disaster it’s made out to be. I would say it’s an ‘ok movie’. I don’t have any great desire to watch it again, but while I did it it held my attention and I kept thinking, “this is not so bad”. I can appreciate the fact the film plays fairly straight with the genre. You won’t see any ghosts or mermaids or any supernatural nonsense invade its territory. The real weak links are the characters and the humdrum story. Had it been able to go further on the story alone, got me more invested in the hunt for the treasure, enjoyed the repartee between Davis and Modine and not relied so much on the action scenes to move things along I think it could have been much better. A well written review, as always. The word Carolco is a forgotten entity these days. Filmmakers who worked with them had nothing but praise for the studio and its chairman Mario Kassar. And the way they gave both freedom and high budgets is pretty much unheard of these days. Carolco's output really was varied, and unlike some independents of the late 80s and early 90s, the budgets they allocated to their productions were high, and Cutthroat Island proved to be their second $100 million movie, their first being T2 which not only broke the record but also became a classic. 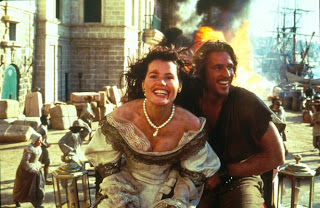 Cutthroat Island however was no classic. I first saw this film around 15 years ago out of curiosity and also because I've long been a fan of swashbucklers. At the time, the pirate genre was poison, Hook may have made some of its money back, but it took a while to do so. 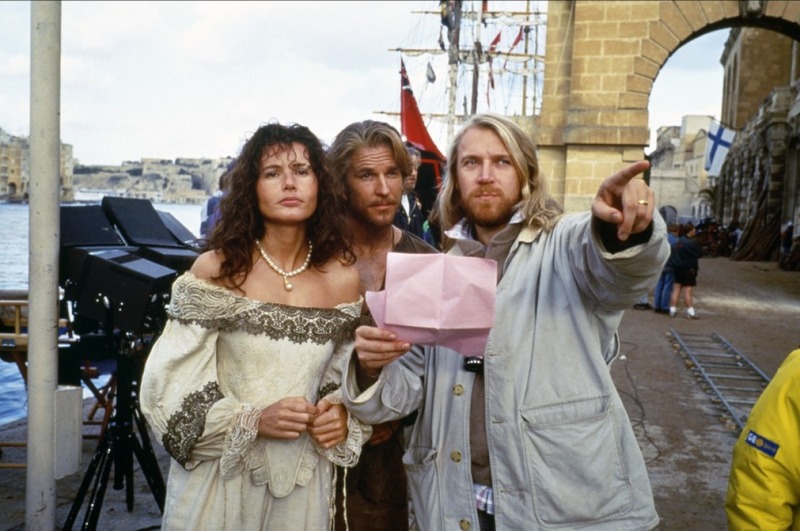 Whilst Roman Polanski's Pirates was the prime example why pirate films were to be left dormant (a budget of $40 million and a box office return of $1 million) This is a shame because despite its many faults, Pirates does have its moments and like Cutthroat Island, it has its major faults. This film is nothing more then a patch work of set pieces, some brilliant, and others mediocre. The highlight for me is the carriage chase when Davis helps Modine escape. But spectacle aside the film is a mess, hardly surprising considering the problems it had. From Michael Douglas dropping out of the picture, to Oliver Reed dropping his pants and showing his appendage to Davis & Harlin in protest! All the way to the accidents which included a large amount of Malta's sewage finding its way into the gigantic water tank where filming was taking place. The release date was pushed back from July to December and a month before its release Carolco filed for bankruptcy protection, whilst MGM reduced its advertising budget from $30 million to $10 million. The fact that Carolco were lucky to raise the $100 million plus budget is nothing short of a miracle due to fact the film had no bona fide stars. But what I find curious are the projects that Carolco sold off or abandoned due to this film, this included Stargate, and Paul Verhoeven's sadly abandoned Crusades project, which was to have starred Arnold Schwarzenegger. Stargate could've gone either way, but in 1994/95 Crusades would have been a big major event movie on the scale of T2. I'd really love to see a documentary or some kind of account of Carolco. The late 80s early 90s they were making a wide range of different films. And like you said they weren't skimping on budgets either! There must be some great stories that happened behind the doors, especially near the end. I had only seen parts of Cutthroat years ago and now watching the whole thing I was surprised it wasn't that bad. The word 'patchwork' is a good description of it. A lot of good stunts in it, I was impressed with the two ships side by side firing at each other in the climax. So I didn't think it was as disastrous as I had always heard. I too would love to see a documentary on Carolco, around ten years ago there was an EW article that talked about the rise and fall of this mini major. If the article is even half true, then Kassar and his original partner Andrew G Vajna (who would go on to form the now defunct Cinergi Productions) really lived the mogul lifestyle, whilst at the same time they were generous to their employees. So much so that other studios were infuriated by the big salaries they offered stars and directors, not to mention the big studios hated it when that regular admin employees were getting better perks at Carolco, then at any other studio. 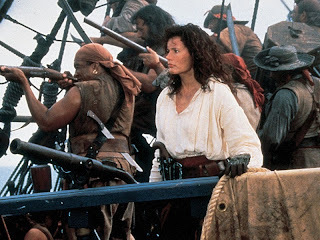 In the book Fiasco; there is a whole chapter devoted to Cutthroat Island, and the writer concludes that the film was only made with one mantra, to get Carolco out of the stigma of bankruptcy. Despite its then astronomical budget, many corners were cut and the script was being rewritten on set to accommodate the change in budget. Also during this time they could've shared the fruits of James Cameron's success. Thanks to Cameron, the studio bought the rights to Spider-Man from 21st Century/Cannon Films. In fact it was thanks to Cannon that the whole rights issue would reach a legal fever pitch in 1999. Anyhow Carolco bought the available rights to Spidey and spent somewhere in the unfriendly neighborhood of $3 million developing the project, before having to sell it due its bankruptcy. However to pour more salt on the wound, Carolco missed out on the opportunity to become the king of the world. Yep Cameron gave them first dibs on Titanic. Sadly however by 1998 Kassar was a very unhappy executive at Paramount where he couldn't get one film greenlit. Hollywood rarely forgets, and never forgives.